Hurricanes, floods, tornadoes, wildfires — devastation comes in many forms. But when dealing with any forecasted natural disaster, preparation is key. Today’s article is sparked by Hurricane Florence. As I type this from my home in the Carolinas, my fellow east coasters and I are coming up with a plan to keep our entire families (human, canine, feline, or any other species under the roof) safe. 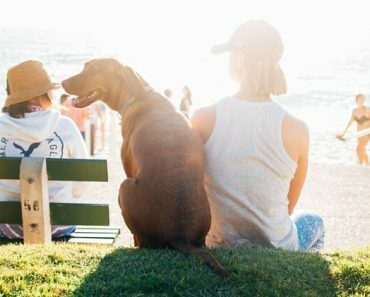 To my fellow pet parents, here are some tips to help you prepare and keep your pets safe during the rocky road ahead. When you know a storm is coming, load up on fresh water, non-perishable foods for yourself, and your pup’s food. 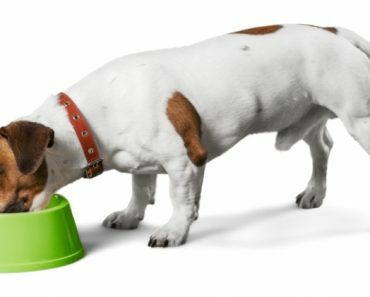 If your dog is on a special diet that requires a freezer, make sure to grab a cooler and some bags of ice in case of a power outage. 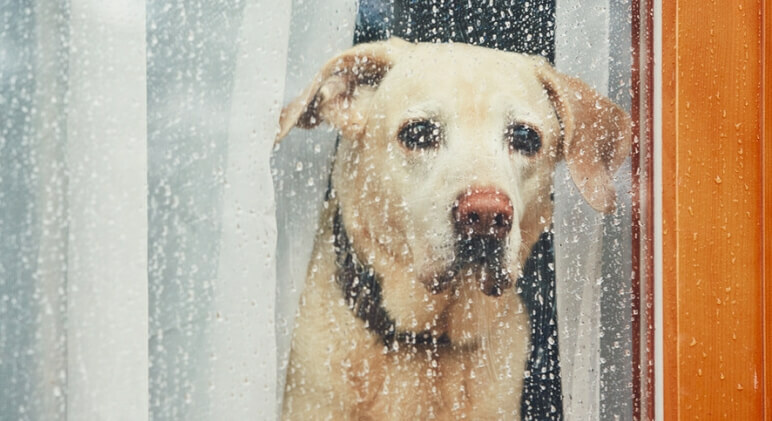 Between the heavy rain, loud claps of thunder, and strong winds, it may not be safe for your dog to be outside. To avoid a potentially dangerous situation (and accidents on your floor) fill a plastic kiddie pool with pieces of sod. Then, put it in your garage. Voila – you’ve just created a safe place for your pups to potty during the storm! *If you do take your dog outside, make sure they are on a leash! When you know a wicked storm is approaching, make sure to check your dog’s medicine stock. Do they have enough to get through the next few weeks? 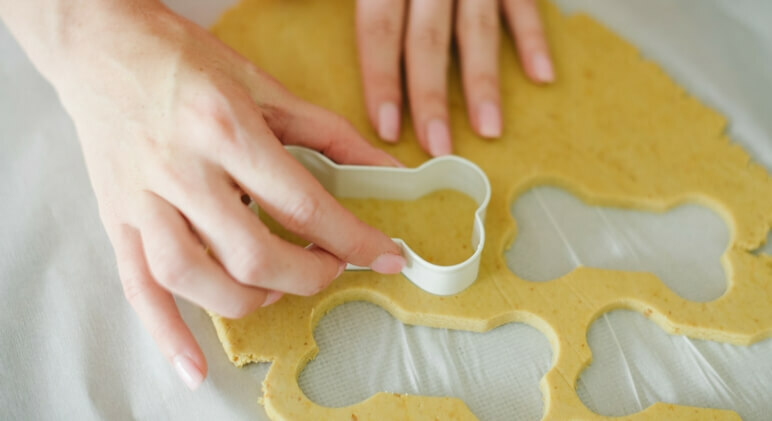 You’ll want enough to get through the storm and any potential aftermath just in case your vet’s office is closed or runs out. Hope for the best, but prepare for the worst. If your dog does get out and dart away from home, updated tags and microchips could help bring him/her back to you! 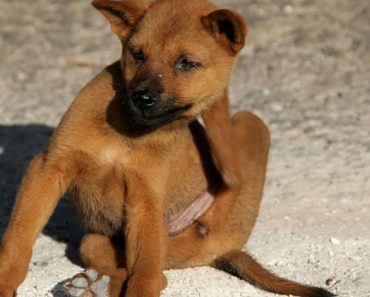 A tag should include the following information: your pet’s name, your phone number, and any urgent medical needs. “safe room” in your home, where you and your dog stay during the most intense times. 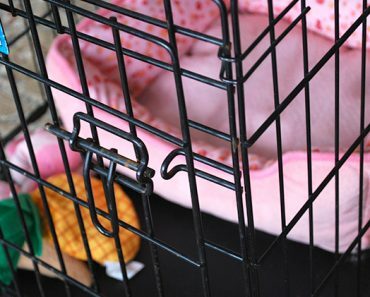 As den animals, many dogs actually view the crate as a safe haven during stressful times. Personally, my Gigi loves to lay in her crate during storms — it makes her feel more secure. 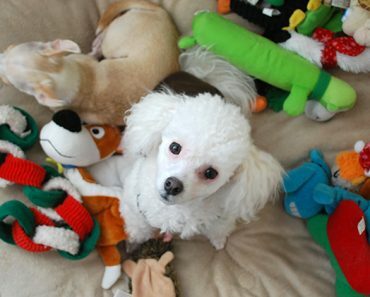 Tip: Fill your dog’s crate with a comfortable bed and some of their toys! A pet first aid kit isn’t much different than a human one — it should include things like gauze pads, wraps, towels, etc. In this article, I highlight 18 pet first aid kit essentials. Call your local evacuation centers to see which accepts pets. If you don’t have any luck there, call around to hotels, animal shelters, and even your veterinarian to arrange a safe haven. Still no luck? Reach out to friends and family who live far enough away from the projected storm path. Check that your fur kid’s collar and ID tag are on securely. 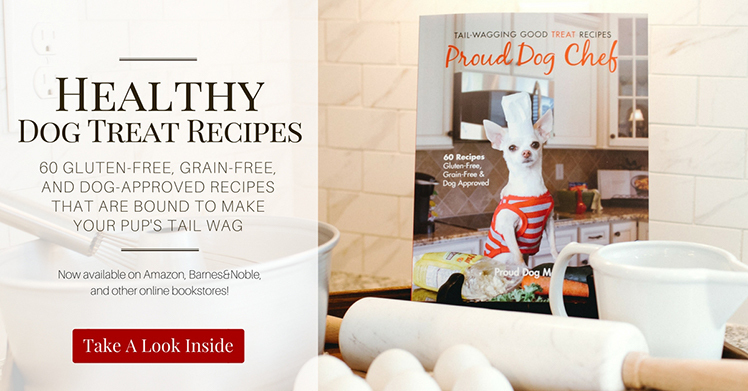 Bring a crate — one your dog can comfortably stand up, turn around, and lie down in. 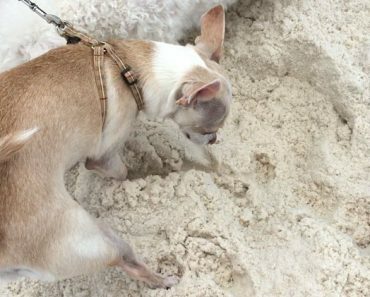 If you have a small dog, bring his travel carrier as well. Make sure the carrier is marked with your name, your pet’s name, and your contact information. Pack enough food, water, and medications for several days. Take their food and water bowls. Grab extra collars/harnesses and leashes. Take blankets, a dog bed, and toys. Always keep a recent photo of your pets in case you wind up getting separated. Since collars and tags can come off, if your dog is not microchipped make sure to have a picture of yourself with your dog. If you are separated, that photo can help identify you as his dog parent and eliminate some confusion.